Image/Skybound Entertainment has revealed their special REDNECK #7 charity variant to support the Houston Coalition for the Homeless. 100% of proceeds from the REDNECK #7 charity variant by Nick Derington will go to the charity. 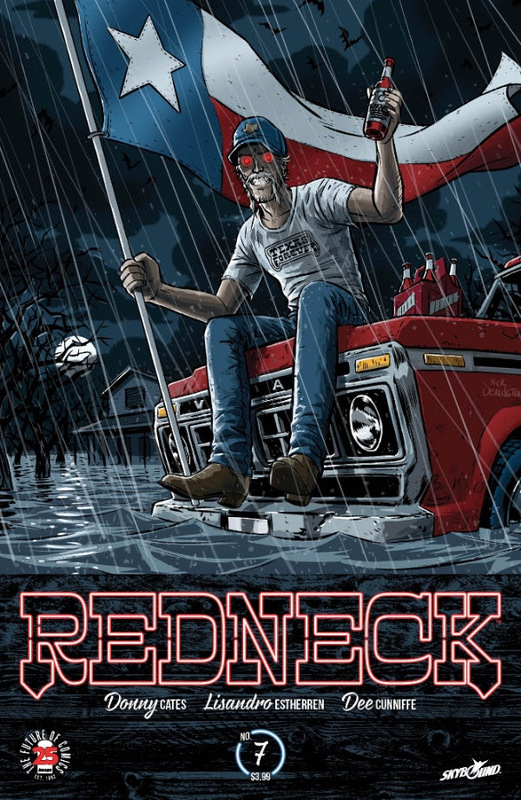 REDNECK is created by Texan writer Donny Cates and artist Lisandro Estherran. In the series, The Bowmans are vampires who have quietly run the local barbecue joint in their small town for years, living off cow’s blood. Their peaceful coexistence ends as generations of hate, fear, and bad blood bubble to the surface—making it impossible to separate man from monster. REDNECK is the tale of a different kind of family just trying to get by, deep in the heart of Texas. REDNECK #7 (Diamond Code SEP170763) by Nick Pitarra and REDNECK #7 charity variant (Diamond Code JUL178523) by Derington will be available on Wednesday, November 20th. The final order cutoff for comics retailers is Monday, October 30th.